Chili's Gives Back - Pflugerville Pets Alive! 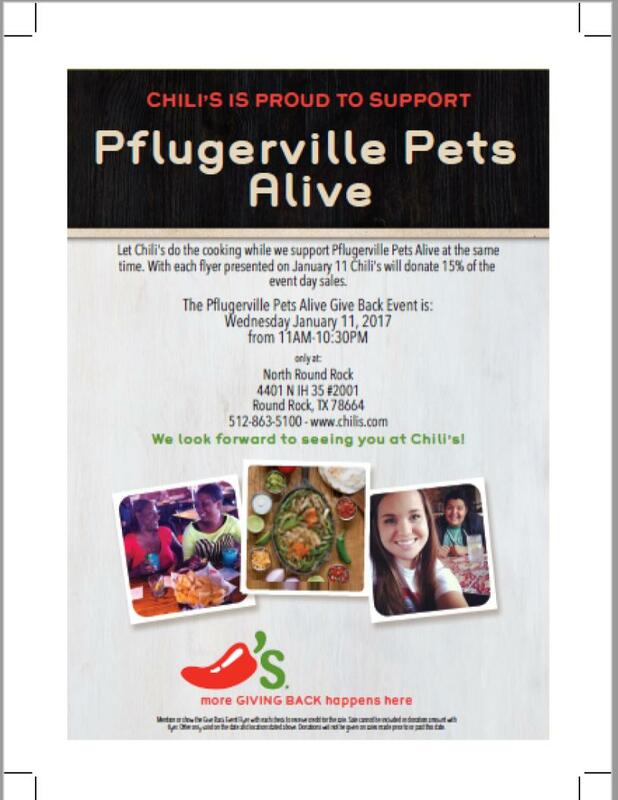 Wednesday, January 11, 2017 let Chili’s do the cooking and help support Pflugerville Pets Alive! It’s the easiest way to support PPA. On Wednesday, January 11 simply dine in at Chili’s North Round Rock located at 4401 N IH 35 #2001 Round Rock, TX 78664 anytime from 11:00 AM – 10:30 PM. 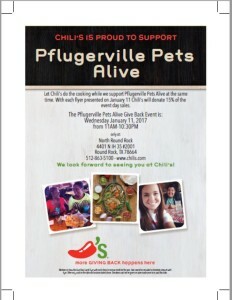 When you order, show your server this flyer or let him/her know you are supporting Pflugerville Pets Alive and Chili’s will donate 15% of your purchase to PPA! It’s that easy. You must either show the flyer or tell your server when you order. It’s the easiest (and most delicious) donation you’ll ever make. In: #Fundraiser, #nonprofit, #Pets, #pflugerville, Events, Pflugerville Pets Alive!